While the caravan was not expected to reach the U.S. border for weeks, hundreds of members were shuttled in buses with federal police escorts along various parts of the journey from Mexico City to Tijuana. The group decided to aim for the west coast rather than traverse more dangerous regions controlled by drug cartels known for being ruthless to migrants. While Tijuana is currently seeing record-setting murders tied to cartel violence. I guess that makes it official our country is now Mexico. Not one word about US immigration officials, just Mexico. Will AMLO be moving in to the WH soon? 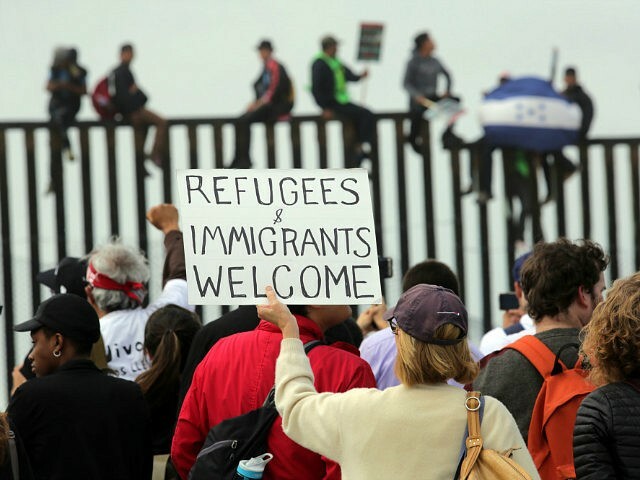 How ridiculous is that so-called security fence and the sign being held up inviting all migrants, including the illegal version, to enter our country! Beezer, southBronx, GeorgiaPeach and 1 others like this. They have no burden of proof. Turn them all away. Mexico can line them up for 25 miles. Do not let them enter our country! MEXICO DOES NOT TELL US WHAT TO DO...OR DO THEY PRESIDENTE TRUMPO? southBronx, MW, stoptheinvaders and 1 others like this. It remains unclear if the migrants will be detained while their asylum claim is processed, or if they will be released due to lack of space in detention facilities. Hmm, the most important question of all goes unanswered? Once their applications are accepted, they should be escorted right back across the border and forced to await any necessary follow-up action (credible fear interview, immigration case hearing, etc.). Our taxpayer dollars are being wasted. President Trump's administration has decided to assist the foreign invasion, to support foreign citizens. President Trump has chosen to spend millions of dollars to care for citizens of other nations over millions of our own deserving citizens. The Trump administration is just continuing what Mexico did to facilitate this invasion. They will be assisting, aiding and abetting, catching and releasing, and transporting people across the nation. They will be on their way to Florida, Texas, Georgia, and elsewhere, soon to be able to vote. The borders are blue and it is spreading. General Mattis is disappointing. Telling the troops they are at the border to be a "confidence booster." Take their "application"...keep them in Mexico. They all have cell phones. TEXT them "application denied, go home"! MW and stoptheinvaders like this. Not a bad idea. And if they don't have a cell phone, we can issue them a cheap one. That would be a heck of a lot cheaper than holding them on our side of the border. Oh, and catch & release should not be an option, period!